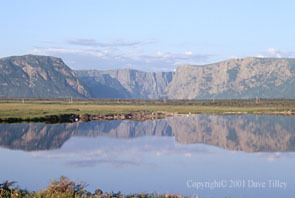 Photography of Wildlife & Natural Areas of Newfoundland, Gros Morne National Park. A rare moment of tranquility in an area where wind speeds can reach 200 kph. Rising 600 metres the 15 km long gorge is a twisting funnel concentrating winds that flow unhindered across the wide expanse of barren plateau. The colder tumbling air is accelerated by gravity lifting sheets of spray from the water surface shooting out unto the lowlands. During fair weather, the gulf of St. Lawrence whips up hair razing souwesterlies that churn up the water surface and transport flies to the northeast coast.